No I'm not giving up milk, eggs and butter to start a vegan lifestyle, nor do I have any vegan friends or relatives, but I enjoy making vegan recipes. I like knowing I'm preserving the friendly chickens that lay their eggs, or the cow that gives me milk to somewhat of an extent, and I don't really eat that much meat to begin with. I've made vegan oatmeal - raisin cookies before and they are my favorite oatmeal cookies, plus it's one of the most popular posts I've done. 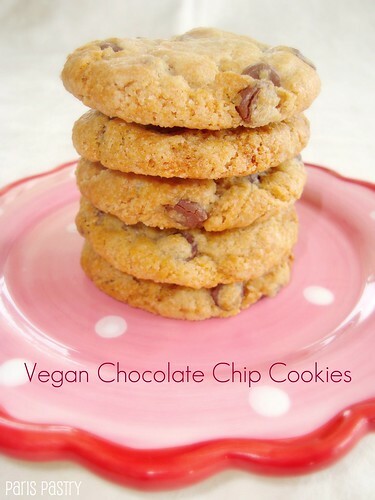 On the quest for an amazing vegan chocolate chip cookie recipe, so good, they even beat out their non-vegan competitors, I stumbled upon this recipe. It replaces butter with vegetable oil, milk with soy milk and eggs with... well nothing. How do they fair off? They're mindblowing! 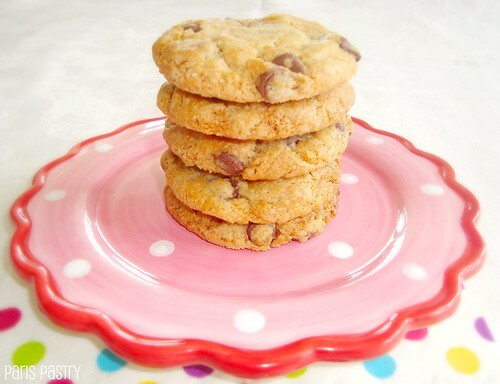 So good, I nicknamed them 'The Best' vegan chocolate chip cookies! You HAVE to give them a try! Rating: 5+ out of 5. 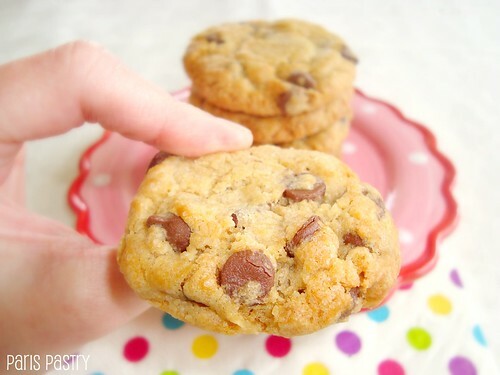 - In a large bowl, whisk together the flour, sugar, baking powder, baking soda, salt, and chocolate chips. In another bowl, combine the vegetable oil, milk, and vanilla. Add the wet mixture to the dry and mix well with a wooden spoon or your hands to get the mixture well incorporated. - Roll dough into compact balls, place on a parchment paper-lined pan, and squish them down to form saucers. Bake in the oven for 10 minutes. Let cookies cool for 5 minutes on the pan before transferring to a wire rack to cool completely. "If someone brings a disgusting cake to a party, that's because they can't bake. And if someone brings a disguting vegan cake at a party, that's because we can't make good cakes without milk and eggs of course!" I really applaud your reason behind this post D. I like to preserve when I can as well, and ironically enough, I am out of eggs! Boo hoo. But are you really saying these are the best best best? Well then girly, first thing tomorrow afternoon I will report back on a verdict ;) Excited!! I just made these with my host sister from Madrid and they were ok...kind of dry in my opinion. Good but not the greatest I've had, and I've had a lot of vegan cookies. My brother, his girlfriend, my mom and 2 sisters tried them too and my brother said they were "good for a vegan cookie, but I could pick them out of a pile of normal cookies." Hmmph :/ I wont be trying these again. I want to prove to people that vegan cookies are just as good and can be even BETTER than conventional non-vegan cookies! I have made these twice now. I brought them to a 4th of July party and fed them to vegans and omnivores to good reviews. They are crispy, so for those wanting a chewier cookie, just sub coconut oil, which will give them the texture like butter. I also used whole grain flours and flax seed to make them healthier and nuttier. Thanks for the recipe! Just made them and they look and taste great! So simple! I am looking forward to trying these. Thanks! Any guess of how many these yield? I'm making cookies for a big party, and I want to give these a try. Mmmmmm they're in the oven right now, and I could barely keep my hands off the dough. Can't wait to taste the actual cookies. Wohoo for Vegan! These were very tasty. I don't think I've had a better vegan chocolate chip cookie :) My dough was a bit hard to handle so I think I'll try folding the chocolate chips into the completed dough next time instead of mixing them in with the dry ingredients. Thanks! I ended up adding way more oil to keep them together. Does this dough freeze well? No idea. Haven't tried, sorry. I am a relatively new vegan, and i just wanted to say that these cookies were absolutely delicious! Very simple recipe. It is exactly what a cookie should taste like. Perfectly moist and gooey. The only minor change i made was add coconut oil instead of canola or vegetable oil. Other than that, it was perfect. Thank you! I just made these and they were so great. I was surprised that the recipe didn't call for a flax seed "egg" or other egg substitute, or apple cider vinegar or the like. I am wondering if I could use 1/2 cup of canola oil and the rest peanut butter. Has anyone tried that yet?